In describing the late-game exploits of NBAers, the “taking over” of a game is often referenced. All too often the heroics in question are confined to three or four moments of brilliance amid an extended run of play. Tuesday night, however, Kyrie Irving painted a fourth quarter masterpiece as comprehensive in its dominance as it was exhilarating. The Cavaliers entered the fourth quarter at home against the Detroit Pistons facing an 11-point deficit (down from 17), with Irving in the midst of an equally frustrating outing – eight points (on just two-of-seven from the field), two rebounds and six assist-negating turnovers. He’d shown flashes midway through the third quarter – first capping a blindingly fast break with a slick dish to Antawn Jamison for a layup, then, on the ensuing possession, freezing fellow rookie Brandon Knight with a fantastic first step (his startlingly high-elevation dunk attempt was blocked) – but had failed to spark a meaningful run. He finished the stanza on the bench, destined for a frustrating defeat. Not so fast, my friend! After Alonzo Gee (who is apparently quite the player) and Ben Gordon (who used to be) swapped jumpers to open the fourth quarter, Irving, in a maneuver after Cheryl Tunt’s heart, grabbed the game by the throat, not easing up until the job was complete. With about 10:20 on the clock and the Cavs down 11, buried a pull-up 3-pointer from the left wing beautiful in not only its fluidity, but its decisiveness. A minute later, the Cavs now trailing by seven, Irving received the ball on the wing again, this time on the right side, and proceeded to emasculate poor Will Bynum with an incomprehensibly quick between-the-legs/behind-the-back that sent Bynum a full two steps in the wrong direction. We’ll disregard Irving’s BLATANT pass to himself (that may somehow – I have no idea how – been legal under the letter of the law, but not its spirit) that immediately followed, because, eh, fuggit, and cut to him cutting the lead to 80-76 with another triple, prompting a Piston time out. Absent from the action for a shade over two minutes, Irving reasserted himself with the Pistons leading 85-79, this time ditching Knight on the right wing and attacking Jason Maxiell with a picture perfect (not hyperbole) midair right-to-left-hand exchange. Less than a minute later, the lead down to a bucket and the game firmly in his grasp, Irving knifed into the lane from the left, drew the undivided attention of every Piston since Fennis Dembo, and found a wide open Jamison in the right corner for a go-ahead 3-pointer. 20-second time out, Pistons. After a pair of Rodney Stuckey free throws put the Pistons back up by a point, Cleveland stumbled into a sputtering possession, unthreateningly passing the ball around. The ball arrived in Irving’s hands at the top of the arc with the shot clock shrinking. Motionless, staring into Stuckey’s eyes for what seemed like a minute, Irving elevated and drilled yet another three, turning a possession that was DOA into delirium at the Q. At the other end, he collected Stuckey’s failed attempt at an answer and, in a mirror image of his finish from moments earlier, nailed Knight to the floor (again) and attacked, this time from the left wing, taking on Ben Wallace and (again) flawlessly switching the ball from right to left before laying it in. Immediately after, some stifling defense brought Stuckey’s 70 seconds of hell to a fitting conclusion. With the Pistons now flailing on offense and their own shot clock winding down, the Cavs smothered Stuckey, who coughed up the ball, which (surprise!) was tracked down by Irving, who, facing the Detroit basket, flung it as though throwing a frisbee at a target behind him, hitting an in-stride Gee for a breakaway flush. Sure, a little more than three minutes remained and the lead was just six, and it’s entirely possible that my advance-knowledge of the result (though not the exact sequence of events) had me playing the result, but it felt clear that the Cavs, well, Kyrie Irving, had sealed the game. Even the ensuing 5-0 run – answered by an Irving layup off of an Antawn Jamison screen – and the game-tying triple by Brandon Knight – answered by an offensive rebound and dunk by Alonzo Gee – at no point did the Pistons’ threat feel like anything more than a dramatic device. 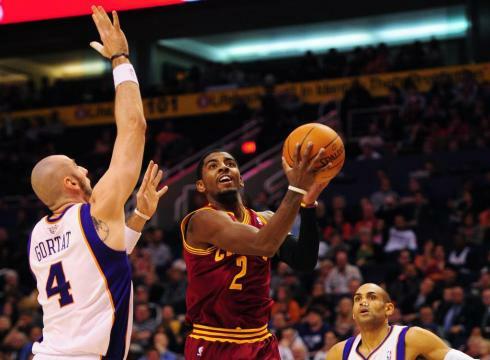 Whatever the case, this fourth quarter performance turned by Kyrie Irving on Tuesday night was special. Truly special. It’s apparent in his demeanor when he brings the ball upcourt, running an offense with the fluidity and implicit confidence of a seasoned vet. It is apparent in his passes – pinpoint lasers that more resemble nonchalant flips, rarely with too much mustard – and in his awesome first step, which he deploys with staggering quickness, while seldom veering out of control. Lost amid the hysteria surrounding Linsanity and (to a lesser extent) Ricky Rubio, a pair of young, new-to-the-NBA playmakers that have taken the league by storm, is the fact that Irving, truly in the midst of a season for the ages, is himself just 19 years of age (for another month) and all of 41 meaningful games removed from his final outing in St. Patrick High School in Elizabeth, NJ.